Scotland have been forced to make a late change to their side to face Wales with Sean Lamont replacing the injured Sean Maitland on the right wing. Lamont, 35, will win his 102nd cap in Cardiff, with Wasps' fly-half/full-back Ruaridh Jackson coming onto the bench. Scotland are aiming to end of a run of eight straight defeats against Wales, and eight losses in the Six Nations stretching back to February 2014. Maitland had recently recovered from a hamstring injury before facing England. 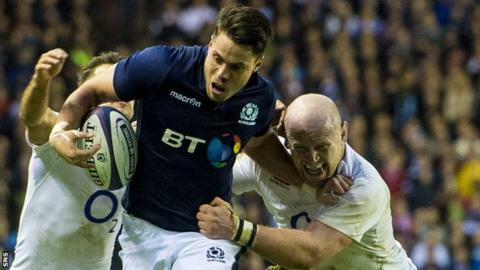 He played the full 80 minutes at Murrayfield in Scotland's 15-9 defeat last Saturday, but has suffered a recurrence of the problem. "Sean had a twinge in his hamstring earlier in the week," explained head coach Vern Cotter. "He thought it was OK at the captain's run yesterday but then felt it again, so we thought it was probably best he didn't take the field."